During the main tourist season in spring, summer and autumn, we offer Ljubljana City Bike Tour daily (in low season we can organize prearranged tours, just send us an email). We have a lot of knowledge about Ljubljana also the kind you cannot find in tourist guides. 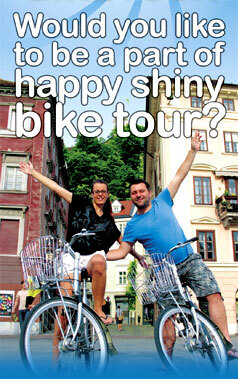 Besides Ljubljana City Bike Tour we offer also other intersting bike tours around Ljubljana. Ljubljana is charming, small city and that's why it's perfect to get the best overview of main city attractions on bikes. That's how we can easy leave the normal beaten tourist tracks and find amazing places, normally visited just by the locals. So ride our bikes and get the experience of the city in relaxed atmosphere. Feel the sun, feel the water, feel the air, feel the freedom!